Well, I did it! As a reformed Arena Queen, I managed to take the plunge from the dark side and surface in the light. Somewhere on the other side of the arena fence was a big wide world, full of equine athletes, zillions of miles of trails, and adventures I never imagined. I still can’t believe I managed to make my dream come true and complete my very first two LD rides this season! Okay, so I didn’t actually “complete” the second one, but I darned near completed it! And surely that counts. What the heck does 8 measly little miles count anyway?! Let me back up a bit and tell you that I am not the adventurous type. I’m the kind of person who panics if I leave home without the cell phone because my car might break down between here and the Kwik Trip, 2 miles away from my house. I would be stranded on the highway and would probably die before anyone ever found me. My experience with adventure consisted of going eyeball to eyeball with a Banana Spider in the garden and screaming in bloody terror all the way back to the house. So it goes without saying that this whole endurance riding thing came as a shock to my family. After all, who would imagine that “I” would set out on trails through the woods when the sight of a spider initiates convulsions?! But, that’s exactly what I did. I think it all started a few years ago when I bought Padrona Auventera, the scraggly little 10 month old pure Arabian filly. 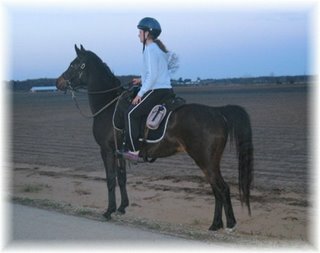 I had dreams of transforming her little 500 pound bay body into an elegant dressage horse, or a flashy halter champion. Those dreams got snubbed out somewhere in the first year of ownership. The little filly was outgoing. She enjoyed taking walks through the woods around the farm, and climbing the manure pile. She played in the water, and seemed to have a love for tarps, small animals, and tree branches. Surely this little horse should be a TRAIL HORSE instead! Yes, that’s it, we will trail ride! The bulk of my trail riding experience was more like hacking around the pastures. But hey, I considered that trail riding. After all, I was riding, and we were on a mowed trail encircling the hay field. Voila! Trail ride! As Padrona moseyed into her 3rd year of life and was under saddle, I figured it was time we hit the trails! After all, that’s what this horse was destined to be. There was a great trail about 1 mile from my house and I intended to take her there to ride. There was no sense in hooking up the trailer to go 1 mile so I set out on foot with the horse in tow. (And of course a supply of water and snacks, cell phone, first aid kit, helmet, and various other necessities for going 1 mile away from your house.) We arrived at the trail and I mounted the brave Padrona for our very first trail ride! All my life I’d wondered if God had a sense of humor, or was He serious and stern? I do believe I learned that day that he has a sense of humor that rivals Pat McManus, or Erma Bombeck. He laughed until he cried as he sent a little black bear out of the woods and directly in the path of Padrona and the woman lacking all sense of risk-taking. Aaaaah! A bear! You don’t see bears in Wisconsin! And you sure don’t see them on your very first trail ride aboard a 3 ½ year old green Arabian! There must have been a mistake somewhere. This bear surely wasn’t meant for me! Spiders and snakes send me shrieking for help, so what am I supposed to do about a BEAR?! Fast forward a bit, and we survived the bear. We even managed to survive some other minor adventures over the next year or so. Turkey and Sandhill Crane sightings eventually became non-events. Creek crossings and railroad tracks were par for the course, and the river was a main staple in our trail riding diet. So now – the moment we’d all been waiting for...an endurance ride!!! My friend Jane is somewhat of the adventurous sort, like myself (tongue in cheek) and so we began to explore the possibility of endurance riding. We found a ride in the Northern Kettle Moraine and knew that this could be our endurance riding debut! I contacted the ride manager and learned the route that the ride would take. That Saturday, Jane and I packed up our trailer and horses and set off for a day of adventure, exploring the trail where this endurance ride would be held. After all, we didn’t dare go to the ride with no previous knowledge of the trail, because that would be too much adventure for us to handle. We rode 18 miles of the trail that day. I had read that endurance riders find out within 1 mile of leaving camp what clothing and equipment works, and what doesn’t work, and yes, they were right. I learned that 90% of my chosen gear slipped into the “doesn’t work” category. All the way home we sat in eerie silence as we contemplated strategy. The trail was harder than we had imagined. There were rocks and hills and stumps. Padrona doesn’t “do” stumps. Stumps morph into Swamp Thing and eat horses for lunch. She does okay if I keep her moving fast and forward and focused. So sometime over the next few days we decided that Jane’s mare might be a little too old to complete a full 25 miles over that trail at the needed pace, so I’d need to find another partner. Enter Tracey to the scene. Tracey is more adventurous than myself, so things looked promising. Tracey rides a motorcycle and what can be more daring than that? So it was settled – Tracey would ride my older Appendix Quarter Horse, Twos’ China Doll (affectionately dubbed “Monster”) on the upcoming endurance ride. The Friday night before ride day arrived, and we were pumped! With the horses loaded and trailer stashed with every manner of portable thing imagined, we were under way! We arrived too late for the pre-ride meeting. Here’s a note to beginners reading this story – you must go to the pre-ride meeting. If you don’t, it’s like leaving for work in the morning without your underwear on. All day you know you’re missing something, and things just don’t quite feel right. So having missed the meeting, we didn’t know where the trail left from camp, or how far out the vet check was, or many of the other little details one might consider essential. But that was okay, we got through our pre-ride vet check, mounted up, and were under way! Within the first 3 nanoseconds we learned what it was like to be left in the dust. I had envisioned trotting along happily for mile after blissful mile, chatting with other competitors and getting to know people. It was a bit of a slap on the head when I realized the only “person” I was chatting with was Padrona. Okay, so I wasn’t chatting. I was cussing. I couldn’t understand how my sweet little girl had turned into a raging dragon foaming at the mouth and cantering in place. Oddly enough, there is something about pure mileage that settles a horse. By about the 10th mile, Padrona was settled in to the pace, and Tracey and Monster were holding their own off our right hip. Let me tell you what, I was so happy to see that vet hold pop into view over the horizon that I wanted to kiss every person there. Sweet relief, we made it halfway! Now we can relax for 40 minutes, grab some grub and a soda, and replenish the senses before heading out again. And then came slap on the head number 2 for the day. If anyone ever tells you the vet hold is a place of relaxation, they have as twisted a sense of humor as God does. I had no idea I could pack so many essential tasks into a 40 minute timeframe. I don’t think I moved that fast when I saw the Banana Spider. And I didn’t know Tracey could move that fast either! It was especially funny to watch her 5 foot 2 inch self trudging through the belly deep weeds to the edge of the woods for a potty break. I’m still trying to rationalize this, but, wouldn’t it make sense for the porta potty to be right at the entrance to the vet hold? Why do they make you sprint 500 yards through the weeds to get to it? Is this some kind of rider conditioning program? Or do these ride managers have a sense of humor too? In any case, we managed to get through the hold, and get back to camp in 5 hours and 1 minute. I was feeling pretty darned proud of our accomplishment until I saw that the front runners completed in 2 and a half hours. How on earth could they have gone twice as fast as us? It looks like I have a lot to learn about this sport! Ride number 2 of the season was slightly more adventurous. We suddenly realized that sometimes rides will be full of tree roots, boulders, and trails skinny enough to warrant throwing a leg up over the saddle, as the beautiful 2-track trail dwindled down into a deer path. We climbed one hill so steep that our horses’ 4-wheel drive almost failed. I was afraid we’d have to push them up. Also on that ride we somehow got lost in the woods and covered more territory than was in the plan. It seemed that we kept covering trail that we were sure we’d ridden already. Either this was the twilight zone, or this Arena Queen was a really bad navigator. Tracey of course was as cool as a 5 foot 2 inch cucumber, despite the sweltering heat. I, on the other hand, was cussing and scanning the landscape for berries and a natural water source. I mean, if we’re going to die out there, we could at least have a berry meal first. Then I remembered, the cell phone!! The blessed cell phone! One call to the ride manager would get us out of the pickle. Reality hit when I got her voicemail. We’re lost in the woods, and our only link to civilization is not taking calls! I called my husband. I figured I could share the misery with him and alert him to the last landmark we passed. He seemed a little annoyed with me. So great, we’re lost in the woods, and he’s annoyed because I’m interrupting him from working on his Camaro. In any case, two people now knew that we were going to die in the woods. Just when I thought all hope was lost, we heard something. We heard something in the woods! Oh no, not a bear. Surely God had had enough fun with me and bears already. No, it wasn’t a bear, it was Steve! Steve was a 100 mile rider out on one of his loops! We weren’t going to die after all! Steve led us out of the woods, and into that blessed vet hold. (Where we worked frantically again for 40 minutes, but this time there was NO porta potty!) I guess they figure when its this sweltering hot, you sweat, you don’t pee. If you feel the need to “go,” just wait a few minutes and you’ll sweat it out. Either that or you were supposed to sprint over the hill to the woods and squat in the poison ivy. (I’m telling you, everybody has a sense of humor but me). On that ride, we managed to get another 12.5 miles to the second hold before we fizzled out. It was too blasted hot, and we were fading fast. The crew at the vet hold tried to convince us to bang out the last 8 miles, but I couldn’t chance any more excitement for the day. I had reached my quota somewhere along the second half of that red loop. Of course I never “really” thought we’d die in the woods, but I was prepared to gather some firewood and ration water for a day or so. And there you have it – a warm welcome to endurance riding! In all my years of riding dressage, I never imagined that my goal for the day would be anything more than making it from A to C and getting that canter transition. I never knew how fulfilling it could be to put your total trust in a horse and know that they will get you back to camp safely. During this ride season I have learned that endurance riders are perhaps the kindest and most caring people in the horse world. Nothing is more important than your safety, and your horse’s safety. And once they know you’re safe, they’ll concentrate on making sure you have a good time. Endurance riders will share their water, their electrolytes, their blankets, their feed, and whatever else you might need. They will congratulate you on a job well done, and offer encouragement to come back and do it again. They will chat with you around the water tank at night, and hold your horse if you need it. So no matter how lacking you may be in the adventurous department, you owe it to yourself to give this sport a try. I don’t believe there can be any more fulfilling and rewarding time you can spend on a horse.